I love one-pot meals and few things making me happier than when I’m tinkering in the kitchen and perfect a recipe for one of these weeknight all-stars. Despite their simplicity, one-pot meals aren’t foolproof. You need to find the right mix of ingredients that will be properly cooked at roughly the same time; get it wrong and you might have under-cooked meat or veggies that have turned to mush. 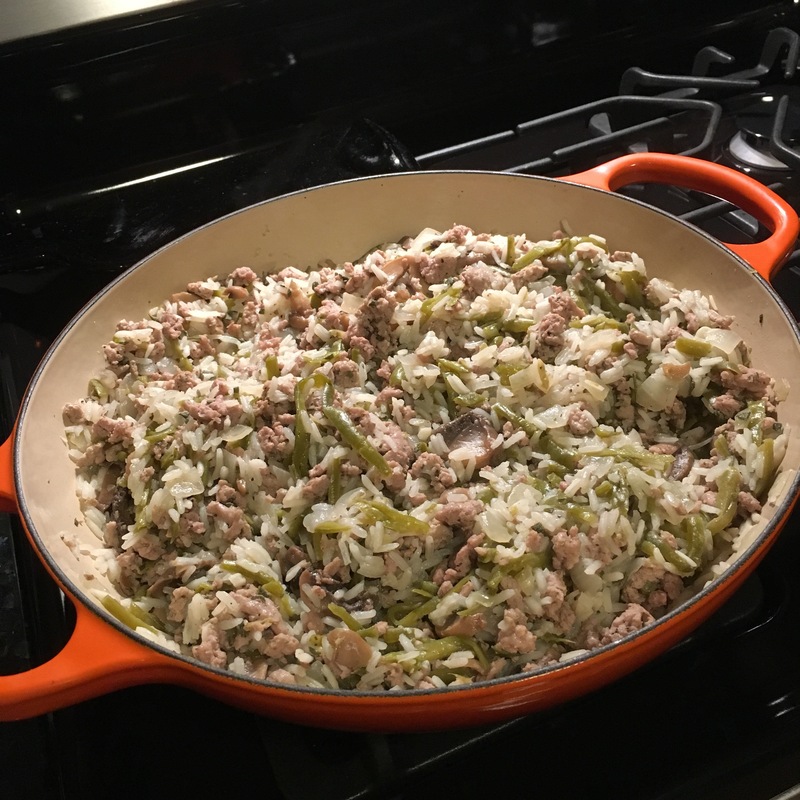 Growing up, we had several variations of this dish, usually made with hamburger and a certain orange box of a seasoned wild rice blend. This version captures the essence of that meal, with far less sodium and fat, by using ground turkey and making our own seasoning blend. Primary flavors of sage, rosemary and garlic combine to make this reminiscent of Thanksgiving, on any given Thursday. * Only have dried herbs? No problem! The rule of thumb for substituting dried herbs is to use half the amount you would if you were using fresh. So here you would use 1 tablespoon of dried sage and 1 tablespoon of dried rosemary. In a high-sided skillet, one with a matching lid, heat the olive oil over medium heat, adding the chopped onions with a pinch of salt. Cook about 5 minutes until the onions begin to soften. Increase the heat to medium-high and add the ground turkey, breaking it up into crumbles as it cooks. After a minute or two, add the sage, rosemary and garlic. Continue stirring. Once the meat is no longer pink, add the rice to the pan and combine well, so that each grain of rice is coated in the pan liquid. Stir in the green beans, mushrooms, chicken stock, pepper and salt (1/2 teaspoon if using low sodium stock, 1 tsp if it’s no-salt-added stock). Raise the heat to high until the liquid begins to bubble. Cover the pan and reduce the heat to low and cook for 20 minutes. Resist the temptation to lift the lid, as the rice will need every drop of moisture to cook properly. After 20 minutes, remove lid and stir everything together. Taste to make sure the rice is cooked and to make sure no more salt or pepper is needed. If the rice is a little firm still, re-cover and let cook another few minutes.